Some random thoughts on our travels so far . . . In the States it was sometimes a surprise when people opened their mouth and spoke English. It felt too foreign. There are far more Mayan people in Guatemala than I ever imagined. They speak their own languages, wear traditional dress and keep their own customs. I have not heard any salsa yet. I have heard the theme from The Third Man played on a traditional giant wooden xylophone (marimba) numerous times. 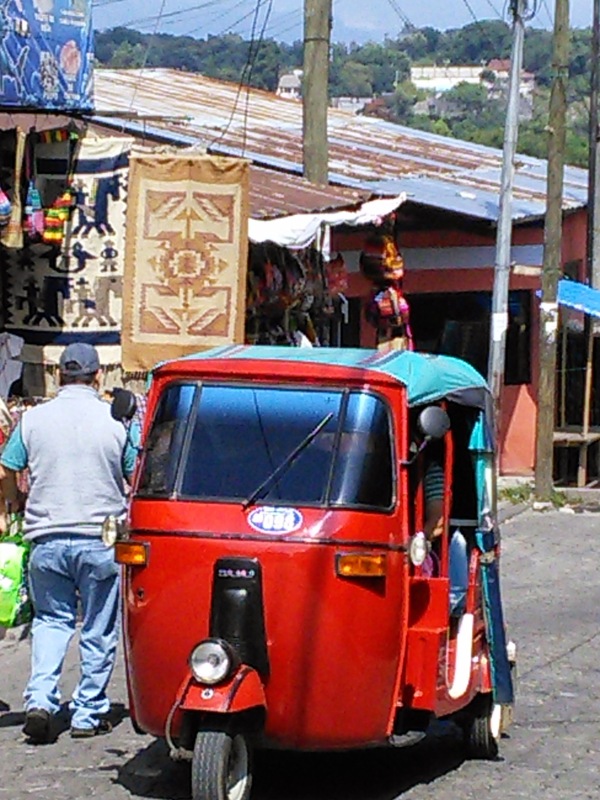 It is sometimes a surprise when a Guatemalan opens their mouth and speaks Spanish. There is nothing Spanish about them. My Spanish is really crap. I can understaand most things but cannot manage anything more than the most basic sentence without it becoming incomprehensible drivel. Guatemalan tortillas are even more tasteless than the ubiquitous wraps we get at home. Most Guatemalan cakes and breads are exceedingly dry. Our current host is called Murray Mintz. I agree with most of what Barbara Kingsolver has to say. -Are there poisonous spiders here? I’ll be sorry to miss the general election next year. There are about 100 NGO’s in Panajachel. Are they all useful? Are all the volunteers useful? Are we useful? Green chili sauce can make pretty much anything taste good. Watching a humming bird hover in a rainbowed water spray is sure to brighten your day. I wouldn’t be bothered about poisonous spiders, unless you plan to eat them. Now, venomous spiders would be a worry!